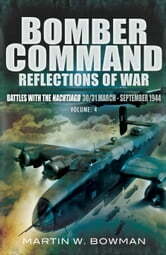 This, the fourth volume of a five part work that provides a comprehensive insight into all aspects of RAF Bomber Command in World War Two, begins in the spring of 1944 with a completely new insight on the catastrophic raid on Nuremburg on the night of 30/31 March and follows with the disastrous attack on Mailly-le-Camp in May. Gradually, the Allied Bomber Offensive began to bear fruit and in June 1944 the invasion of Normandy took place under an umbrella of almost total Allied air superiority. 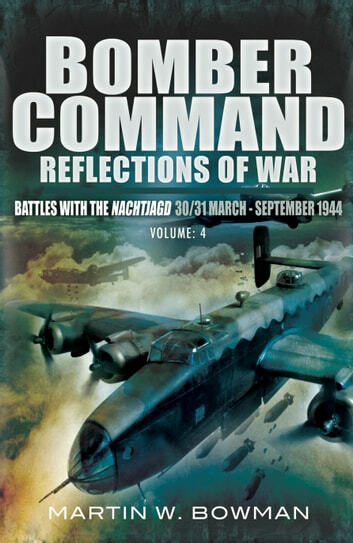 RAF Bomber Command was to play a huge part in what proved to be the final steps to ultimate victory, returning to the mass raids on German cities by night and even mounting raids on the Reich by day. The author’s well-tried formula of using background information interspersed with the crews’ personal narrative takes you raid by raid through each tour of ops while carrying full bomb loads in sub-zero temperatures, blighted by atrocious weather conditions and dogged by fear of fire, death or serious injury or having to endure months if not years of miserable existence and near starvation behind the wire in notorious PoW camps. The path to peace was paved with the unmitigated slow ebbing of courage with an ever-present possibility of death unannounced from a prowling night fighter, nondescript and unseen, as night after incessant night, shattered and ailing bombers could run out of luck to crash in some foreign field while other crews, almost ‘home’ – almost empty - ran out of fuel and died horrible tortuous deaths in twisted and tangled wreckage. Not for them the glory that was accorded The ‘Few’ but as Winston Churchill said: ‘Fighters are our salvation, but the bombers alone provide the means of victory’.